Prices are subject to exchange rate fluctuations and airfare or departure tax increases. Experience rustic luxury in natural harmony with our tropical island and ocean surrounds. A boutique collection of 12 thatched Beach Pool Villas line a postcard perfect beach and reveal panoramic Indian Ocean views, enjoyed from your outdoor deck as you sunbathe, refresh in your plunge pool or doze off in a hammock. 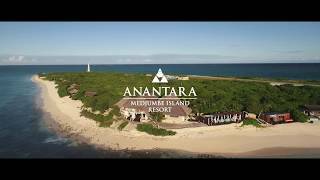 Beautifully furnished interiors blend comfortable luxury with Anantara’s signature modern amenities, to offer the ultimate island hideaway. Wake up to a view of endless blue stretching as far as the eye can see, and perhaps a cool dip in your personal plunge pool. Spend a lazy morning basking under the African sun or strolling along soft powdery sands and dipping your toes in the azure Indian Ocean. Swing in your hammock, caressed by a tropical breeze and lulled into relaxation by gently breaking waves. In the evenings, unwind with a cocktail in hand, until the stars beckon a sumptuous dinner. At a resort that feels miles away from the rest of the world, our chefs dish up the kind of culinary diversity that promises to satisfy your cravings, while enticing you to try something new and tantalising. From Mozambique’s bold flavours to European classics hailing from Portuguese colonial times, a nod to the finest global fair and flame grilled ocean treasures, dining at Anantara Medjumbe Island serves endless highlights of mouthwatering indulgence. Each day begins with a breakfast which can be deliciously nutritious or a hearty affair, depending on your mood and preferences. Return for lunch and dinner to choose from a carefully crafted á la carte menu and enjoy the sumptuous three course set menus which change daily for your dining pleasure. Sample local specialties and refined western classics, or let our expert chefs transform the lobster, calamari, fish and mangrove crab, caught fresh by local fishermen, into delectable seafood feasts. Bahari offers one of the most incredible views in the Quirimbas and is open throughout the day and evening so that you can enjoy the evolving ambience. Relax in an open plan layout that allows the ocean breeze to drift in. Sit around low tables, or gather at the bar on high stools to watch our bartender concoct your favourite tipple. Ascend to our rooftop lounge to snuggle into a sofa or armchair and read a good book from the library. Enjoy an afternoon tea, play games or simply relax as you gaze over the sweeping bay and glorious Indian Ocean. Take a refreshing dip, float about to your heart’s content and swim energising laps in between sunbathing and reading in the shade. Relax into blissful pool time, in a tranquil setting overlooking the azure Indian Ocean. Our naturally secluded island of lush tropical landscapes and tidal pools is an ornithologist’s delight for spotting rare bird species, a vast range of Palaeartctic migrants and a variety of waders. Humpback whales from the Antarctic migrate to the warm tropical waters of the Quirimbas Archipelago between July and October to give birth to their calves, and a few months later these young whales make the long journey back to their Antarctic feeding grounds. Embark on an inspirational boat trip to be greeted by whales swimming peacefully alongside, watching these majestic creatures arching gracefully over the waves. Set sail aboard our hand crafted dhow sailing boat for a voyage of ocean discovery at the most romantic time of day. See our idyllic island from a unique perspective and marvel as a mesmerising sunset unfolds. Making this cruise even more indulgent, tailored beverages and canapés can be requested for you to savour in a world of your own. The Quirimbas Archipelago is the perfect place to try a wide range of water sports. Snorkel in a captivating underwater world and go deep sea fishing for prize catches. Water ski, wakeboard, kneeboard and go tubing at exhilarating speed. Glide at a serene pace in a kayak or on a stand up paddle board. Sailing enthusiasts can enjoy Hobie cat excursions. The clear waters of the Quirimbas Archipelago are warm year round, ranging from 25 - 29 degrees Celsius, with an average visibility of 20 metres reaching as far as 50 metres in summer, creating ideal scuba diving conditions. Explore dazzling reefs that are only accessible from our island, and as we only take out small groups of divers, these reefs remain pristine and healthy for future generations to enjoy. A range of scuba courses cater for beginners and qualified divers looking to take their skills to the next level. While certified divers can book excursions to experience some of the best coral life in the world, with a series of incredible dive sites all within a 15 minute boat ride of our resort. Discover Sambi Sambi’s large coral mount, which rises to a depth of 3 - 5 metres at the pinnacle and features a 12 metre plateau with sides sloping steeply into the depths of the ocean where large hard coral formations are found, along with large schools of fish, the occasional turtle, as well as small kingfish and dogtooth tuna brought in by the incoming tide. Neptune’s Nursery is a large flat coral reef system made up of finger corals, large table corals and a diversity of reef creatures, including smaller macro marine life such a nudibranches and shrimps, accompanied by plentiful blue spotted stingrays and camouflaged crocodile fish for divers with keen eyes. Large and flat, Brereton’s Reef is home to small coral bommies covered in small fish species such as anthias or goldies, as well as a number of blue spotted stingrays. Most impressive of all, the Edge of Reason features a 15 metre shelf leading to a sheer vertical cliff dropping off into the depths of an abyss. This stunning wall dive is covered in huge gorgonian fans and features small caves. Admire a huge school of giant sweetlips who hang motionless as you swim by, as well as groupers that are sometimes larger than the divers, green turtles, honeycomb and giant morays, ribbon eels, longnose hawkfish and leaf fish.